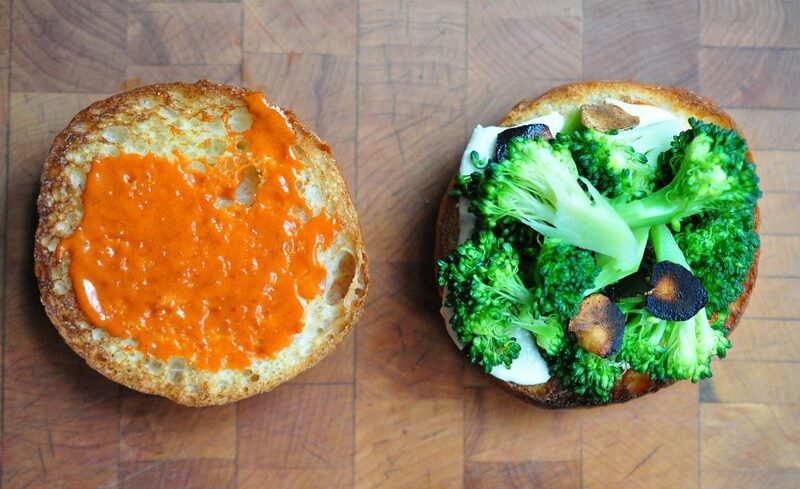 I rarely bother making anything but the simplest sandwiches at home—grilled cheese, PB&J—but this broccoli gochujang sandwich has all the cheesy, crunchy, tangy satisfying elements you want from a sandwich, while coming together quite quickly, just in the time it takes to boil the water and then steam the broccoli. 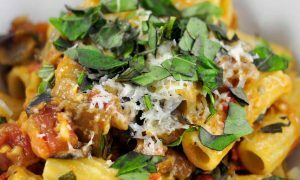 It was at least partially inspired by both a broccoli rabe sandwich with mozzarella and the broccoli sandwich at NYC’s famed No. 7 Sub. Their garlic chips are amazing. I think I might have to start putting garlic chips on all my sandwiches. 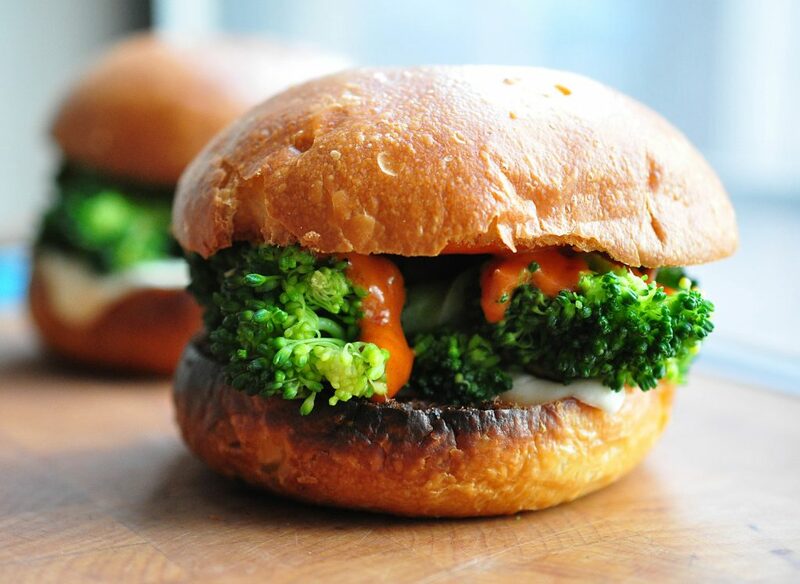 A tangy, crunchy, garlicky broccoli sandwich reminiscent of the delicious concoction from NYC's famed No. 7 Sub. While you wait for the water to boil, place a small pan on medium heat and melt the butter. Fry the garlic in the butter until dark brown and crispy. Take them off the heat and put them in a small bowl. Mmmmm garlic chips. In another small bowl, combine the mayo, gochujang paste, and soy sauce and mix thoroughly. 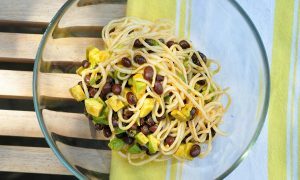 Once the water is boiling, drop the stem pieces of broccoli into the pot and boil for 1 minute before adding the florets. Boil for another 3 minutes. Remove a piece of broccoli from the water. If it is tender enough that a fork goes through with no resistance you're done. If not, leave them to boil for another minute or two. When tender, pour the broccoli into a strainer and let it stand until it's cool enough to touch. Add salt to the broccoli to taste. Assembly time! Split the brioche buns in half. 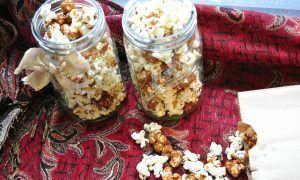 Toast them in the toaster oven or under the broiler until light golden. Slather the bottom of the bun in a generous layer of the chili mayo. Top the bottom half with mozzarella and toast again until the mozzarella just begins to melt. 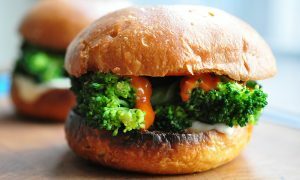 Carefully place a layer of broccoli on top of the bottom bun. 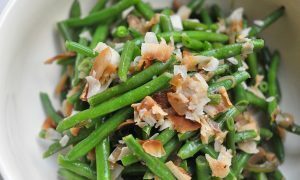 Sprinkle a few of the toasted garlic pieces on top and continue to add more broccoli until you have used it all up or you worry that your tower of broccoli will not hold. This is like jenga. Try to create a nest that will hold once you bite into the sandwich. Sprinkle with the remaining garlic chips. Slather the top bun half with the rest of the chili mayo and top the sandwich.